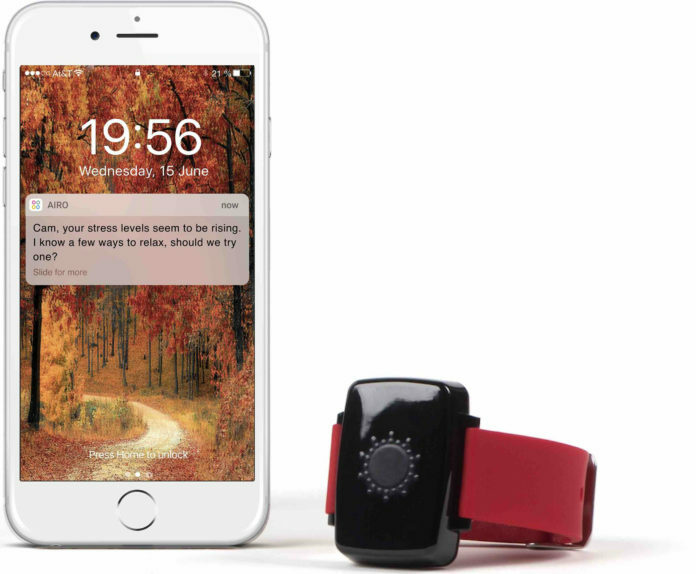 Waterloo-based startup, Airo Health, now aims to create a wearable technology to track, detect, and prevent stress while promoting overall wellness. The inspiration for the product was one deeply rooted in Kumar’s own experiences of anxiety as an undergraduate student. Having faced a great deal of difficulty along the path to graduation, Kumar recalled his own days spent in ignorance of mental health. Although he later achieved his goal — a degree in engineering — looking back on it, Kumar said he dove into his studies “head first” and with little consideration for his well-being. Together, these factors made his time in undergraduate studies unnecessarily difficult. The technology works by measuring and recording user’s stress levels and the body’s response to day-to-day activities from stubbed toes to bad drivers. These events prompt one of two fundamental responses. “It’s either your sympathetic system, which is fight or flight, or your parasympathetic system, which is rest and relax. So the body is actually constantly … going back and forth between these neurosystems,” Kumar said. The neuroresponse prompts a change in blood flow, which is then measured by light-emitting diodes on the bottom of the wristband. The light, which reflects back to the wristband, is then gathered by a series of photodiodes, translated into data, and displayed on the user’s smart phone. By tracking blood flow Kumar said it is possible to “reverse engineer” the results to determine which of the systems is most active on a day-to-day basis and degree/extent of stress. “But at what point does that data become … something you can actually do to change your life?” he asked. According to Kumar, the importance of this tracking capability is not only the moment-to-moment awareness of stress, but the ability to analyze trends and patterns in stress over time. The app associated with the device is accompanied by a notification system which alerts the user when stress levels are on the rise. Following a software update in the coming weeks, it will invite users to participate in a personalized resonant breathing exercise. Kumar said the key is to prevent and mitigate stress before it escalates beyond the point of intervention, said Kumar. Looking back on it, it is clear to Kumar that what he was really experiencing was anxiety. “It was pretty clear [that] if I had something like Airo back then, I think … both my mental and physical health would be drastically different,” he said. Kumar hopes the technology will go on to help a broad range of individuals from diverse backgrounds and lifestyles in identifying stressors, creating healthy coping strategies, and helping to implement behavioural change. Kumar and fellow engineering graduate and co-founder, Maryam Jahed, started Airo Health in 2012 at the Velocity Garage startup incubator, where product development first began as an effort to track food intake. Having just graduated at the time, Kumar admitted to “being a little bit naive” in the endeavour; monitoring the effects of diet by way of a wearable device would not prove simple for the team. “We took on the hardest task we could find,” he recalled. These efforts have been under development for the past four years, with co-founders Kumar and Jahed as the main test subjects. “Once upon a time, we were eating the exact same thing for three months straight so we could measure how our bodies were changing in response to it,” Kumar said. According to Kumar, research and development efforts continue in partnership with the University of Guelph, where the duo’s early studies are being proven to this day. It’s a topic that has been troublesome for the team in the past. Recalling the initial years of the startup, Kumar told Imprint that Airo Health first attempted to address the issue in 2013. At the time, however, market reception was poor and investors largely uninterested. Kumar hypothesized that people were simply uncomfortable with monitoring their mental health. Yet, in the years since, there has been a remarkable change in the level of comfort in ideas of surrounding mental health, Kumar noted. Not only have communities seemed more willing to discuss mental health, there have also been a great many efforts to improve it. Airo Health has since seen therapists and psychologists approaching them for partnerships to pilot the technology. Locally, the company is looking for funding to be able to donate the units to a community health centre in Kitchener and in Brantford, a couple of hundred have been employed for use already. “It’s just incredible how the state of mental health … has changed in the last five years,” Kumar said.